The worldwide mobile phone market grew 1.9 percent year over year in the fourth quarter of 2012 (4Q12), as strong holiday smartphone sales raised shipments of these devices to levels nearly equal to those of feature phones. 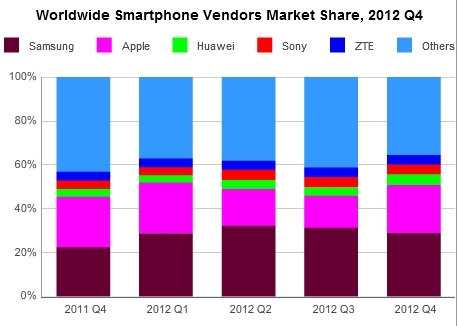 According to the latest market study by International Data Corporation (IDC), vendors shipped a total of 482.5 million mobile phones in 4Q12 compared to 473.4 million units in the fourth quarter of 2011. For the full year, the global market for mobile phones grew 1.2 percent on shipments of more than 1.7 billion units. In the worldwide smartphone market, vendors shipped 219.4 million units in 4Q12, which represents 45.5 percent of all mobile phone shipments, the highest percentage ever. The 36.4 percent year-over-year growth was slightly below IDC's forecast of 39.5 percent for the quarter. On an annual basis, 712.6 million smartphones were shipped globally in 2012, which was 44.1 percent more than in 2011. "The high-growth smartphone market, though dominated by Samsung and Apple, still presents ample opportunities for challengers," said Kevin Restivo, senior research analyst at IDC. Vendors with unique market advantages, such as lower-cost devices, can rapidly gain market share, especially in emerging markets. Samsung set a new record for the number of smartphones shipped in a single quarter and in a single year. Its broad and deep line-up of Android smartphones, particularly the Galaxy-branded Android family, combined with sustained demand for its mid-range and entry-level models to account for the remarkable shipment volumes. 2013 is shaping up to be a pivotal year for Samsung as its Tizen smartphone strategy takes shape. Samsung will continue to rely on Android as its primary operating system, however, as the move to Tizen will not likely take place overnight. Apple's record iPhone shipments in the quarter were driven by successes in Greater China, where shipments more than doubled, as well as the U.S., where 6.2 million iPhones were activated on Verizon alone. Interestingly, the company's success was due in large part to older models, in particular the iPhone 4, which Apple couldn't make enough of in the quarter relative to demand. Its sales success with the older model could portend success in higher-growth emerging markets where the company has performed well.